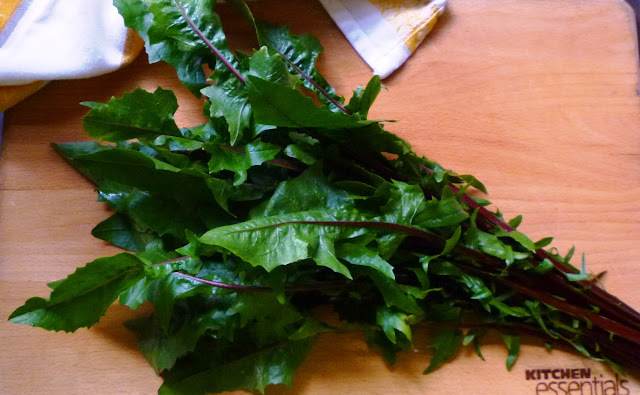 All summer long I have noticed that one of the growers at my farmers' market has had dandelion greens for sale at their stall. I have intended several times to grab a bunch, but for some reason I never did. But a couple of weeks ago, I finally remembered to take a minute to ask about them. The variety they are growing is a red ribbed Italian heirloom—a member of the chicory family. They told me that like other members of this family, the dandelion greens can be quite bitter and they have found that they are best when cooked. Since I love some of the other chicories (endive, frisée and escarole), I bought a bunch. When treated properly, the bitter edge of these lettuces and greens can be delicious and interesting. It's just a matter of combining them with things that will balance and compliment the bitterness. Judicious use of acidity (tomato, citrus, vinegar, etc. ), salt (cured meats, anchovy, olives, etc.) and fat (fatty meats, olive oil, etc.) can turn something that is one dimensionally bitter into something that has delicious complexity and flavor. The dandelion greens that I purchased—with their ruby colored ribs—reminded me of chard and beet greens...both of which can also be slightly bitter (although not as bitter as chicory). In the fall and winter I love pairing these kinds of greens with bland starchy things... Things like polenta, potatoes and white beans. 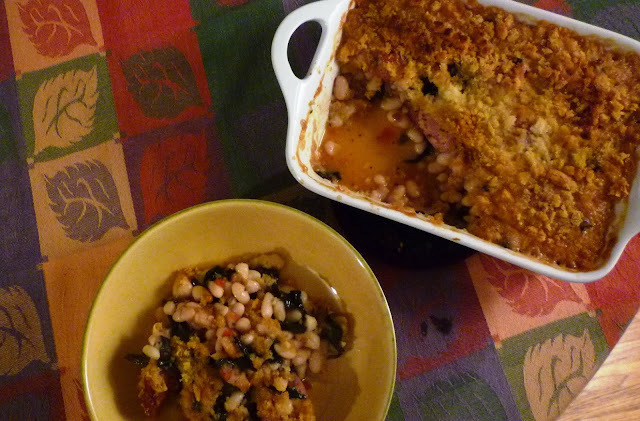 Considering all this, I decided to use my dandelion greens in a French-style shell bean gratin. Beans and greens are one of my favorite food combinations. Whether combined in a soup...or the gratin...the greens that are used for a preparation like this are given ample cooking time to sort of "give up" their bitterness. When I have prepared gratins like this in the past, I have occasionally included some optional tomato. Their acidity serves to brighten the blandness of the beans and can be a nice addition. 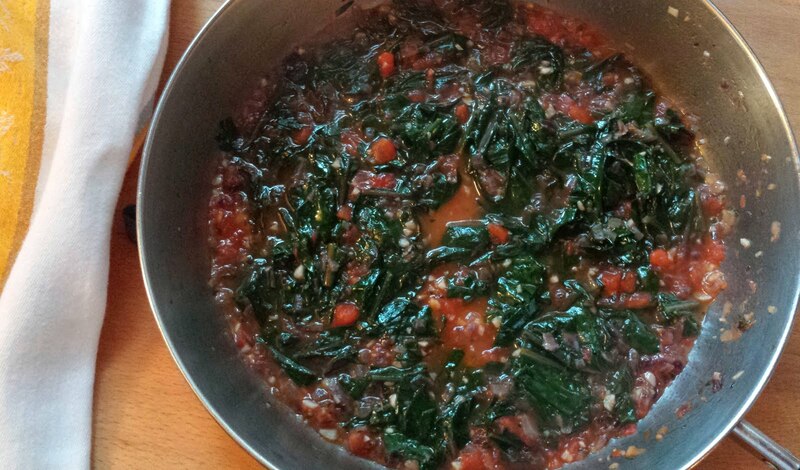 In the case of my gratin with the dandelion greens, the acidity of the tomato seemed like an essential. Finally, I added some salty, fatty, garlic sausages to the mix. Not only did they provide a perfect foil for the dandelion greens, they turned what I have always considered a side dish into a satisfying entrée. I'm certain you could omit the sausage...but since this makes a fantastic one dish meal when you include it, I'm not sure you would want to. One final observation about this gratin: As you look at the image of the gratin before it goes into the oven and compare it to the image of the finished, baked gratin, you will be struck with how beautiful the unbaked one is. You might be tempted when you make it to just serve it before baking it. After all, all of the ingredients are cooked, so why not serve the more beautiful version? 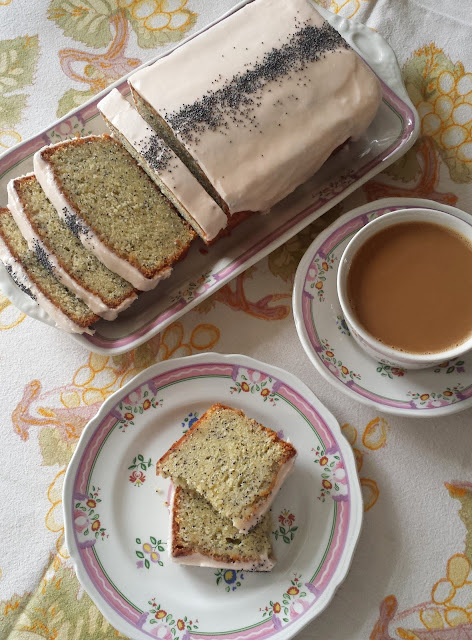 And while I know the unbaked version would be good, it will lack the delicious intermingling of flavors that happens during the baking process. Just like a good stew or braise that tastes even better after it has had a day to sit, so the baking process of the gratin produces a richness of flavor that can't be matched in the unbaked version. Besides, making this simple medley of beans, greens, tomatoes and sausage into a gratin allows you to work ahead—something that is a huge bonus for anyone who cooks. 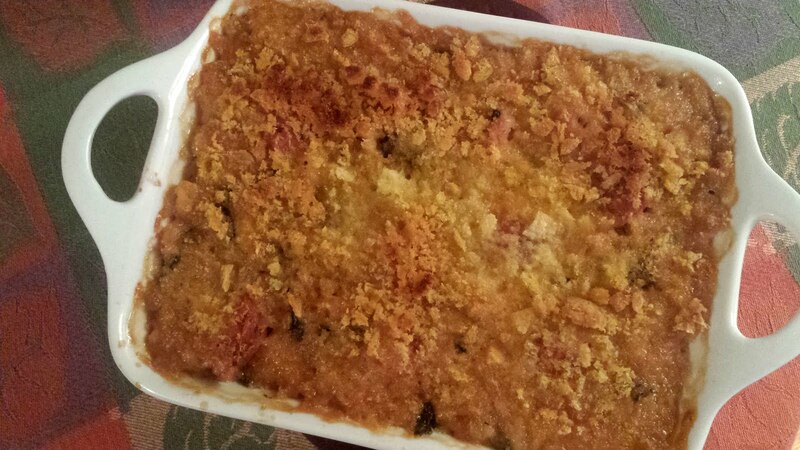 I couldn't believe how delicious and flavorful my gratin was. I don't know if it was the addition of the dandelion greens...or simply the combination of a few perfect flavor partners, but I will definitely be making it again. And I will certainly be making a point in the future to find more ways to serve dandelion greens at my table. Drain and rinse the beans. Place them in a large saucepan and cover with fresh water by 2 inches. Bring to a boil. Lower the heat and skim off the foam that has risen to the surface. Add 2 T. of olive oil and a sprig of thyme. Cook the beans at a gentle simmer, stirring occasionally, until the beans are tender. Or, place the soaked, drained beans in a shallow gratin, drizzle with the olive oil and add a sprig of thyme. Cover with boiling water by an inch, cover the pan with a tight fitting lid, or a piece of foil. Transfer to a 325° oven and bake until tender. Whether you cook the beans on the stove top or in the oven, they will take about an hour and 15 minutes to cook. Add salt to taste when the beans are half cooked. Beans may be cooked ahead. Cool the beans in their cooking liquid. To prepare the gratin, warm 2 T. of olive oil in a wide sauté pan. Add the onion, minced thyme and some salt. Gently sweat the onions until they are tender and translucent (about 10 minutes). Add the garlic and continue to cook until fragrant. Add the tomatoes and cook for 5 minutes. Add the greens along with a ladleful of the bean cooking liquid and cook until the greens are wilted and tender. Taste and salt as necessary. 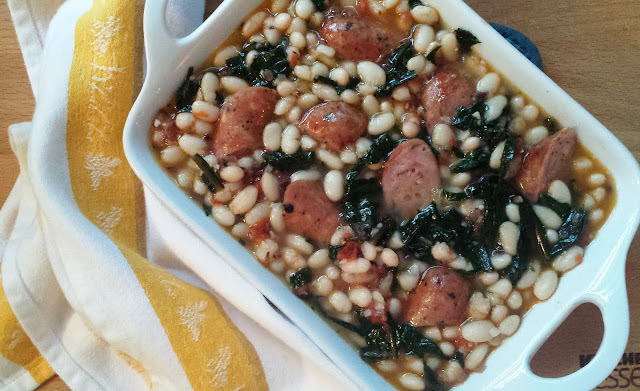 To make a simple side dish of beans and greens, simply omit the sausage. Without the sausage, the gratin will serve 4 to 6 as a side dish. You may use any kind of white bean that you prefer...Cannellini, Flageolet, etc. Just be aware that not all varieties will cook in the same amount of time as the Great Northerns. You may use greens other than dandelions. A small bunch (or half a bunch, if you prefer) of chard or kale (any kind) will work. If you use a whole bunch, you will have about twice as much trimmed weight as with the dandelions. 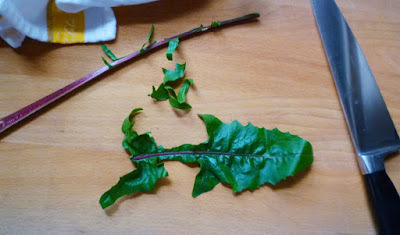 For the both chard and kale, remove all of the ribs/stems. The chard may be added exactly as the dandelions. The kale should be blanched since it takes much longer to cook. To blanch it, drop the clean, trimmed and sliced kale in boiling, salted water and cook until tender. Drain and spread on a baking sheet to cool. Add to the onion and tomatoes and heat through. To make toasted breadcrumbs, use the food processor to process sliced/torn "day-old" bread (crusts removed if they are very hard) until bread is in uniform soft crumbs. Spread crumbs on a rimmed cookie sheet and “toast” in a 350 degree oven until golden brown and dry, stirring occasionally (about 10 minutes). Drizzle crumbs with olive oil and toss to combine. Crumbs can be used immediately or cooled and stored airtight at room temperature for a week or so...or frozen for longer. Recipe is easily doubled. Use a 3 quart gratin/shallow baking dish. I want to make this gratin! It sounds wonderful. You do not have to post this comment. I just wanted to share my experience cooking beans. I cooked pinto beans every few days in New Mexico for 25 years; cooking them on top of the stove, sometimes soaking sometimes not. Great results even using beans many years old, left in an old ranch house. Then I moved to Indiana and had terrible results cooking beans. Finally my daughter received a cookbook as a science award from her high school. It discussed cooking beans and said that in New England people used distilled water instead of tap water. Ah ha! So I added that to my process. I can't remember how I found the final step, perhaps the same source. But I just wash the beans, cover with distilled water, put in a cold oven and set for 250 degrees. Pintos are perfect in 4 hours. No spill overs on top of the stove and works every time, everywhere! Cecilia, Thanks so much for sharing your experience with cooking beans! Beans can be tricky. I have never tried distilled water (I don't usually keep it on hand), but I do like cooking beans in the oven. You probably noticed it is the alternate method in the recipe...although I don't do it as low (and consequently for as long). Cooking beans on the stove top does seem to encourage the beans to cook unevenly. I picked up the oven method I mention in the recipe from Deborah Madison's book Vegetarian Cooking for Everyone. I will have to try your lower temp sometime. I do have one recipe that I make...with pinto beans...that uses the oven at 250-deg: Spicy Braised Pork with Pinto Beans It cooks for 8 hours though...I imagine this is because of the acidity in the tomatoes (which I have heard can interfere with the softening of the beans) and all of the other ingredients. The recipe turns out perfectly every time. I don't know why I never thought to try it with just the beans. Thanks again for commenting. 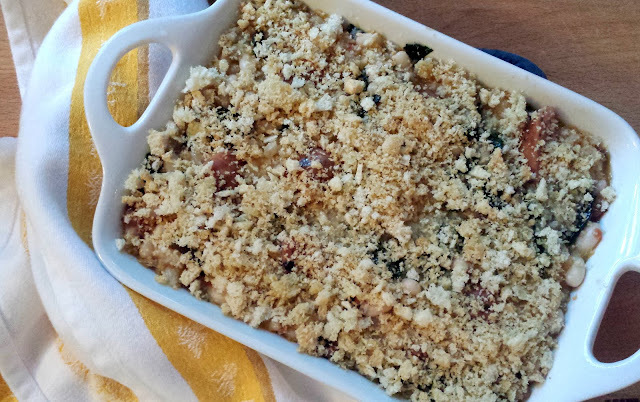 And if you love beans, I do think you will love this gratin! I have made your Spicy Pork and Pinto Beans many times! It is very easy and tastes great and is one of my favorite dishes. I forgot that it uses the slow cooking in the oven of beans without presoaking. Does your recipe mention heating the pot on the cooktop to boiling before putting in the oven? This tends to speed things along when needed and does not seem to change the final result. That dish reminds me of Red-eye Braised Lamb Shanks and Beans from Gourmet 1996 which also cooks beans with a braised meat. I haven't made it for a while and have never used the coffee, but if I make it again I think I will use the coffee. The combination of finely chopped red pepper, carrot, onion, garlic, and bacon is just great. I always watch for your next recipe! I have never heated the spicy pork and beans up before putting it in the oven...although I've thought about it (figuring it would knock a couple of hours off of the cooking time). It's nice to hear that it works well. I have never made that dish from Gourmet...I will have to look it up, it sounds fantastic! It means so much to me to know that you enjoy my posts...and cook with the recipes I share. Thanks for letting me know!